With films such as Dragon Ball: Evolution and the controversial Ghost in the Shell, Hollywood anime adaptations have (mostly) not been great. Some suffer from a lack of imagination while others contribute to the issue of whitewashing in Western cinema. The latest adaptation in the genre has been in development since 2000 and marks Robert Rodriguez’s directorial return since 2014’s Sin City: A Dame to Kill For. Based on the 1990 manga by Yukito Kishiro, Alita: Battle Angel focuses on Alita (Bird Box actress Rosa Salazar), a disembodied cyborg who has lost her memories in a post-apocalyptic world. Rescued by cyberphysician Dr Ido (Christoph Waltz), she begins to remember her past and her extraordinary abilities. Titanic director James Cameron was so keen to develop a live-action adaptation, 20th Century Fox registered the ‘battleangelalita.com’ domain to the filmmaker in 2000. However, Cameron started working on a little film called Avatar and its belated sequels, putting Alita back into development hell. The project was eventually saved in 2015 by Robert Rodriguez, who signed on to direct the film after creating a shooting script. 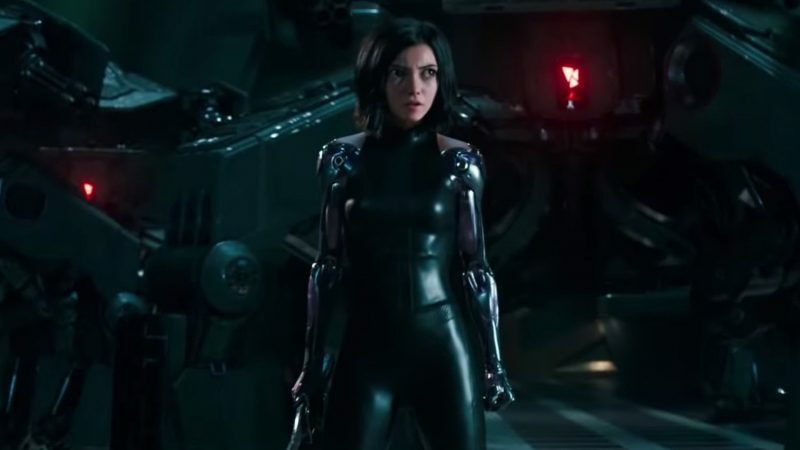 Despite his initial commitment to bringing Alita to the big screen, Cameron’s lacklustre screenwriting efforts have resulted in an overly sentimental heroine. Her empathy and confusion about her identity stem from certain male characters who have conflicting attitudes as to who she should be. On one side, there is the jaded Ido who keeps her past a secret while love interest Hugo (newcomer Keean Johnson) inspires her to more than a cyborg to his benefit. Not only does this complicate character development, but this also dampens Alita’s persona as a ‘badass’ female hero. This isn’t helped by the wasted supporting cast as Jennifer Connolly, Mahershala Ali and Ed Skrein don’t do much but be sinister antagonists. However, the visuals more than compensate for the dull dialogue and uninspiring plot. Rodriguez has proved that he is visually creative through his work on the Sin City, Spy Kids and Machete films. However, Alita is his most ambitious project to date. Thankfully, he beautifully creates this vast, dystopic world of inter-mingling cultures of Iron City, which is positioned under the floating city Zalem. Rodriguez emphasises the chaotic clash of social classes while stretching the animation to stay faithful to the original anime. The action scenes, in particular, whether Alita displays incredible skills in fighting or Motorball – a fast-paced, violent version of roller derby – are particularly stunning. Overall, Alita: Battle Angel looks great but the overly sentimental script and uneven character development come across as a rushed mess. Alita: Battle Angel is out in UK cinemas on 6 February 2019.